How to Transfer Data to New iPhone XS (Max)/XR/X/8/7/6s - iMobie Inc. 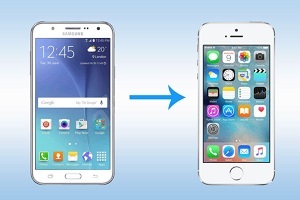 If you were an old iPhone user, and just upgrade the old one to the newest, this guide is also helpful for you to transfer everything from old iPhone to the new iPhone; And if you were an Android user and switch to the new iPhone just now, you definitely need this tutorial to help you transfer data to new iPhone. 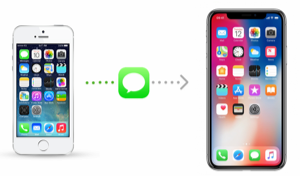 Want to transfer data from old iPhone to new iPhone XS (Max)/XR/X/8/7/6s/6? This article is intended to show you several practical ways to transfer everything from iPhone to iPhone. Keep reading on this post to learn more. 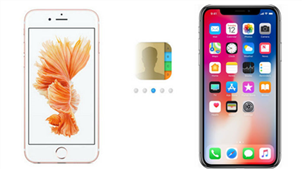 So to help you go through a smooth and pleasant “Upgrade to New iPhone” journey, Here in the post, we will show you every single detail of how to transfer data to new iPhone, no matter you were an iPhone user or an Android one. 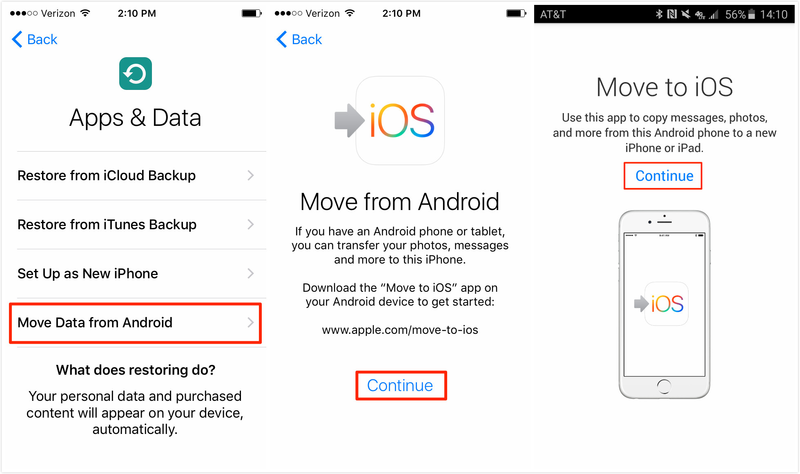 So obviously this guide is going to divide into two parts: How to Transfer Data to New iPhone (if you were an iPhone user), and How to Transfer Data to New iPhone (if you were an Android user). 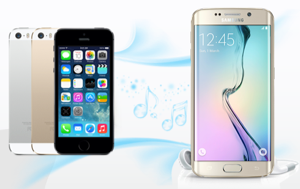 So choose the right section to start your new iPhone data switching journey now. Normally for most users, transferring everything from one iPhone to another by iTunes or iCloud is the first solution that comes to mind. However, you can’t choose what to transfer. And the iTunes and iCloud restore will inevitably erase the current data on your target iPhone. Moreover, both iTunes and iCloud can’t help you back up all data, let alone transferring data from one iPhone to another wholly. Allow you to transfer 24+ types of iOS data to your new iPhone, including Photos, Contacts, Messages, Notes, even some data that are not supported to be backed up via iTunes/iCloud, such as non-purchased music, ringtones, movies, etc. 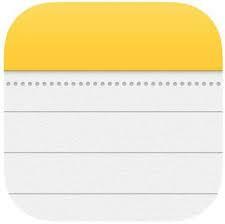 Enable you to transfer everything to new iPhone in one click or selectively transfer data from one iPhone to another. 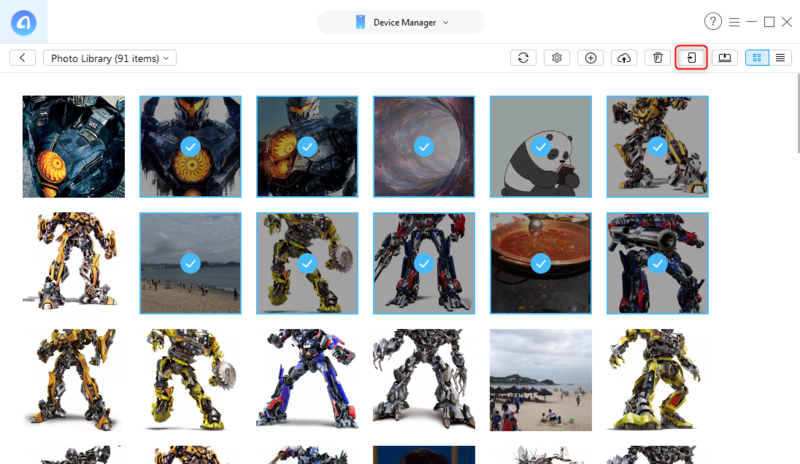 A preview of all the iPhone files and data is allowed on the computer. Super fast transferring speed. For example, it only takes you 5 minutes to transfer over 3000 photos and songs. Guarantees you 100% Safe & Security. During this process, all the contents on your old iPhone and new iPhone will be kept safe. You won’t lose any data or file. If you have already made an iTunes or iCloud backup, it can help you extract data from the previous backups without performing full restoration on your new iPhone. Moreover, no existing data on your new iPhone will be erased. Step 1. Free download AnyTrans for iOS on your computer > Install and run it. Step 2. Connect both the old iPhone and the new one to the computer with USB cable > Choose Clone Device or Merge Device on the homepage of AnyTrans. 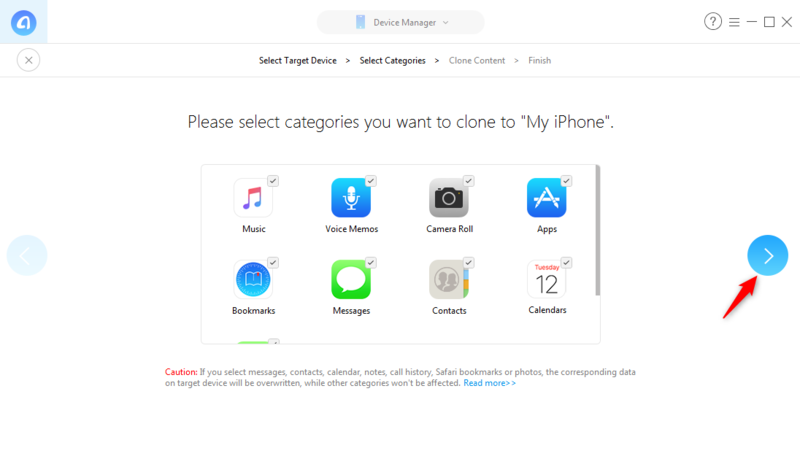 Clone Device – suits for those whose new iPhone is totally new, and doesn’t have any data on it. 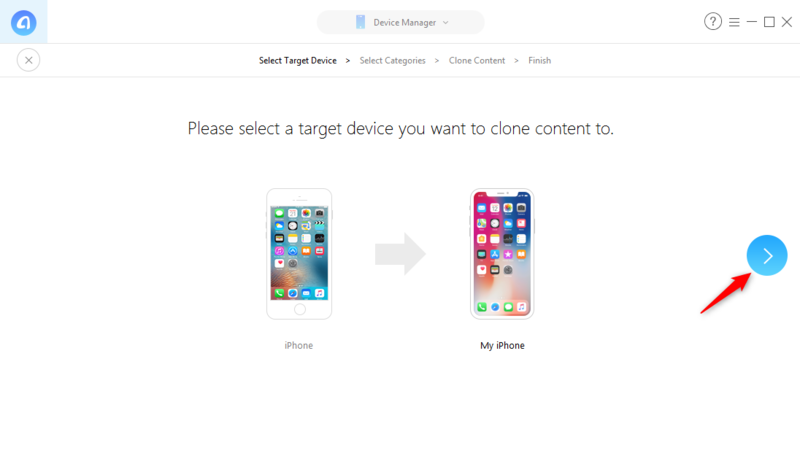 Clone Device will clone all the data and files from old iPhone to new iPhone XS (Max)/XR/X/8/7/6s/6, and the data on the new iPhone will be erased during transferring. Merge Device – suits for those whose iPhone already has been used. 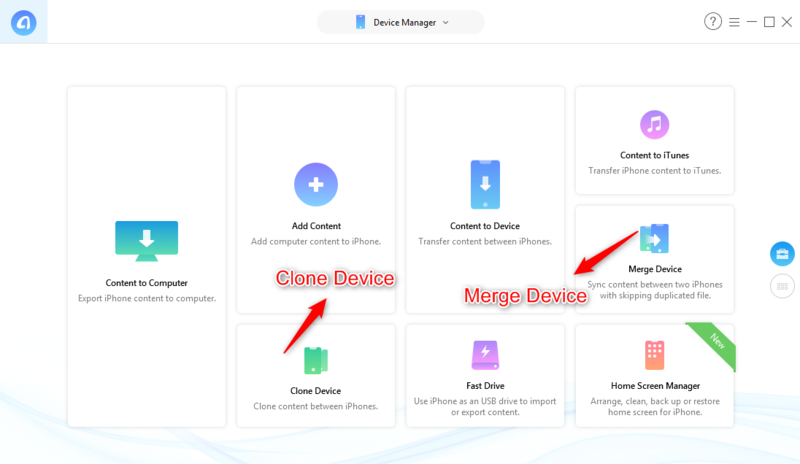 Merge Device will transfer data from old iPhone to new iPhone XS (Max)/XR/X/8/7/6s/6 wholly, and the existing data on the new iPhone will remain intact during content merging. Step 3. Here we take the Clone Device mode as an example: Click Clone Device > Select the target device > Click Right Arrow to go next step. Step 4: Select the categories you want to transfer to new iPhone, like Photos, Messages, Contents, Notes, Apps, etc., and click the Right Arrow. Then wait for the process to finish. Step 5. 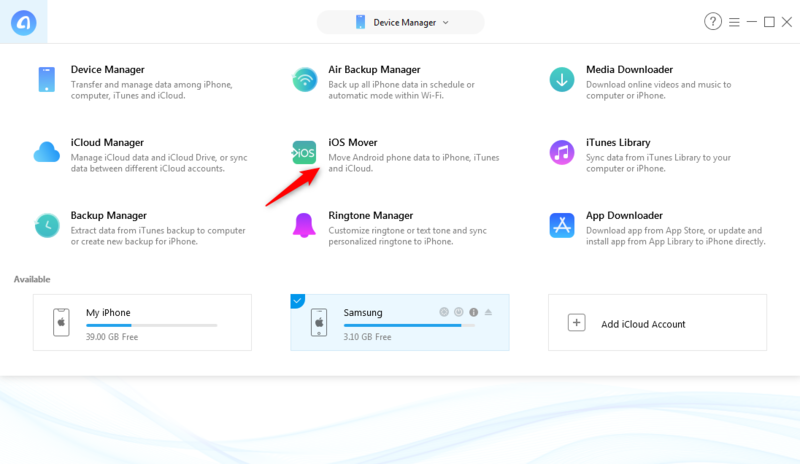 If you do not plan to transfer all contents on old iPhone to new iPhone, but just some specific data type(s), you need to jump to the category page at the first step. And there you will see all data types on your old iPhone. Step 6. Then choose the detailed data type. Here we take Photos > Photo Library as an Example. 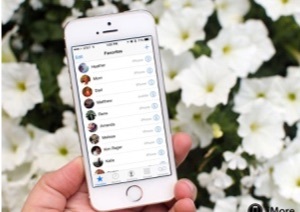 Next, select the photos that you plan to transfer to new iPhone > Click on Send to Device button to start transferring them. 2. If your new iPhone has not been set up, turn on your new iPhone. A “Hello” screen with different languages should show > Follow the steps mentioned on the screen until you see the Apps & Data screen, then choose Restore from iTunes Backup > Next. If you already set up your new device before, you just need to move to step 3. 3. Connect your new iPhone to the computer that you have backed up your old device in step 1. 4. Open iTunes on your computer and select the device tab. 5. Select Restore Backup. Then choose a backup. Please make sure it’s the correct one by looking at the date and size of each if you have more than one iTunes backup. 6. If the backup file was encrypted, enter your password and unlock it when asked. 7. Wait for the restore process to finish, then complete the rest of the setup steps on your iOS device. Dozens of minutes probably will be needed. 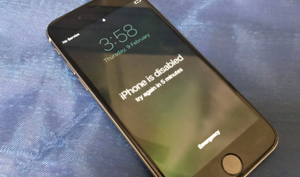 If possible, keep your device connected to an available Wi-Fi and in charge after setup, which allows photos, music, apps, and other contents stored in iCloud to automatically download back to your new iPhone. When transferring data from one iPhone to another with iTunes backup, all the content in the iTunes backup will be restored to the new iPhone no matter whether you want to restore all of them; and some media files (like Apps, music, ringtones, movies, iBooks, etc.) won’t be transferred during this process. If you want to transfer all the contents to new iPhone (even media files), and selectively, just the data items you want, you can move to Method 1 to make it. We notice that most of you are visiting this guide on iPhone or iPad, and you may want to find a method to transfer data from iPhone to iPhone without computer. To be honest, you indeed can transfer data from one iPhone to another without computer, but the only way is using iCloud backup and iCloud syncing. However, it has several shortcomings like: takes you 30 to 60 minutes to make it; requires your Wi-Fi network is enough fast; you may lose important data during transferring; media files (like Films, Apps, Music, Ringtones, iBooks, etc.) can’t be transferred, etc. Therefore, we recommend you to transfer data new iPhone with computer as Method 1 does, all the contents will be transferred to new iPhone, and all the contents on both of your two iPhones will keep safe. 1. Back up of your old iPhone firstly, if you haven’t made one before. For iPhones running with iOS 10 and later: go to Settings App > Tap on your Apple ID’s profile > Click iCloud > iCloud Backup > Click Back Up Now; For iPhones running with iOS 9 or older: go to Settings App > iCloud > Backup > Turn on “iCloud Backup” if it is closed > Tap on Back Up Now. 2. If your new iPhone has not been set up, turn on your new iPhone. A “Hello” screen with different languages should show > Follow the steps mentioned on the screen until you see the Apps & Data screen, then choose Restore from iCloud Backup > Select the backup you have created before > Next. 3. 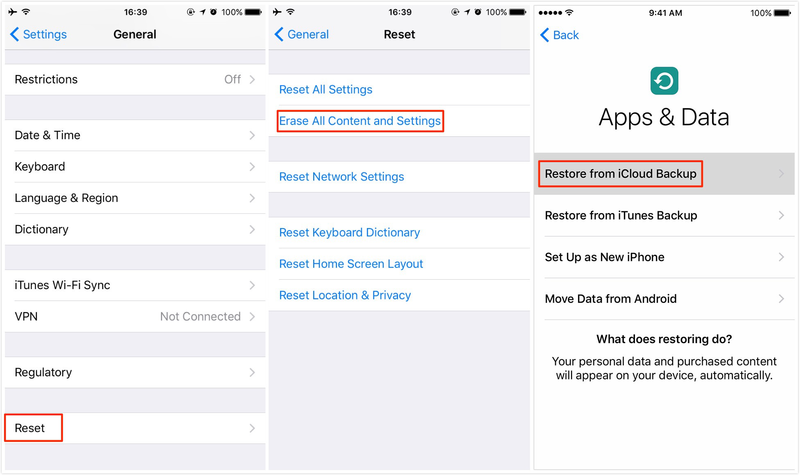 If you already set up your new device before, you need to set it up again: Go to Settings > Tap Apple ID > General > Reset > Erase All Content and Settings > Erase iPhone > Set up your iPhone again > Select Restore from iCloud > Select the backup you just created. There is no doubt that not just iPhone users switch to new iPhone every year, but many Android users start trying a totally different mobile device – iPhone. Everyone should try new stuff, especially the better ones. But when you choose from Android phones to iPhones, you have to also face the same issue: How to transfer my old Android data to my new iPhone? In this part, we have collected two practical methods to help you with this annoying issue. Check them now. 1. 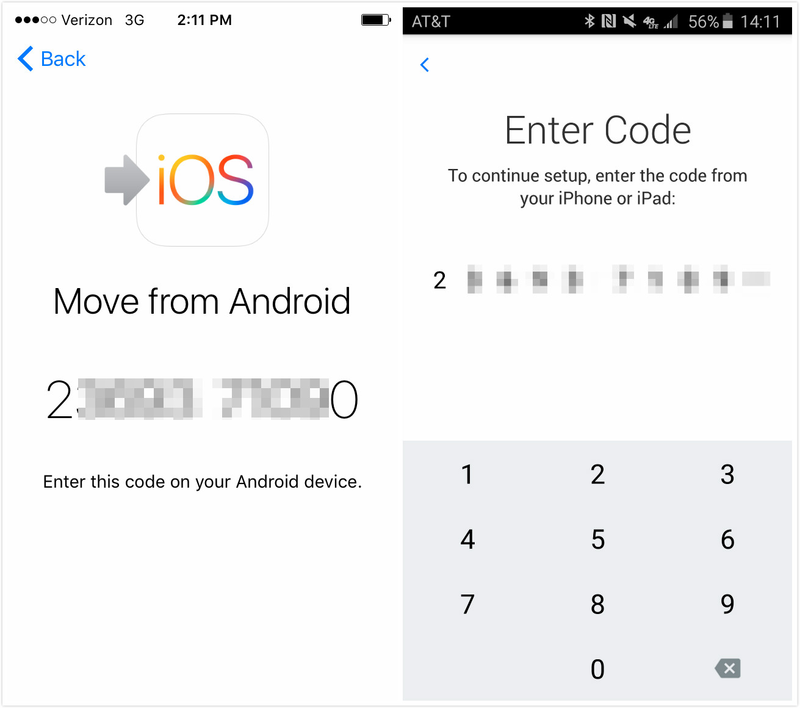 If your new iPhone is still not activated, power it on, and a Hello screen would pop up > Follow the instruction on the screen till you reach the page of App & Data > Choose Move Data from Android option > Tap Continue > Continue again on the next page > There it will show the code number. If your new iPhone has been set up, you need to reset it and follow the steps above. 2. Then launch Move to iOS app on your old Android phone. If you have not installed it, please go to the Google Apps Store to get it > Then it will ask you for the digit code > Enter the code displayed on iPhone. 3. Then switch to your new iPhone. It will ask you to choose data types to move, and choose the types you want > Tap Next to start Android data moving > After the process finishes, tap Done on Android phone and tap Continue on your new iPhone to finish the setup process. 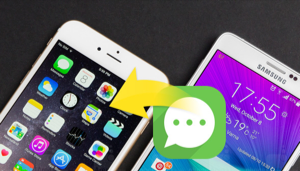 Since Move to iOS sometimes makes your new iPhone upgrading not so smoothly, we here recommend you the second tool to help you with transferring Android data to new iPhone. And it is still the AnyTrans for iOS. With it, you will not encounter such problems that Move to iOS has, but 100% smoothly upgrading experience. Besides, compared to Move to iOS, AnyTrans supports more Android data types moving to iPhone. Why not give it a free download now, and follow the steps below to make it? Step 1. Install and run AnyTrans on your computer > Connect both of your Android phone and iPhone to it > Click on the Device Manager option on the top > Choose iOS Mover. Step 2. Then it will display all data types on Android > Select the data types that you would like to transfer > Click the right arrow to continue with Android data transferring to iPhone. Member of iMobie team, a great lover of iDevices. Always enjoy helping to solve all kinds of iOS and Android problems. 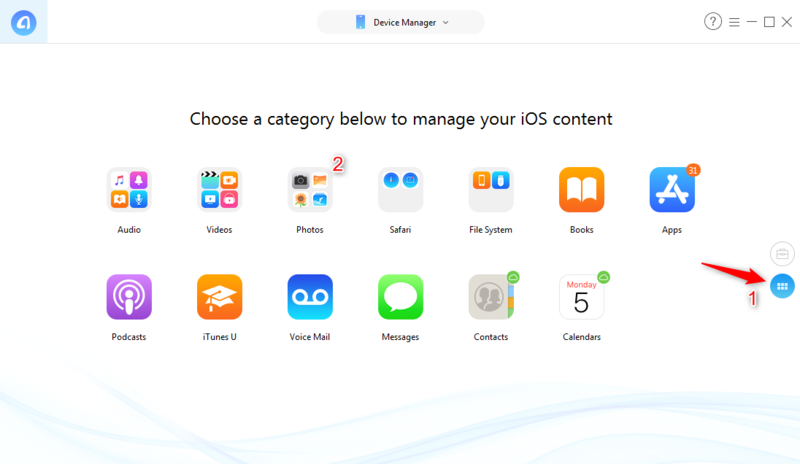 The best tool to transfer, backup and manage your iPhone iPad content, even iTunes, iCloud backup files. As easy as ABC! Copyright © 2019 iMobie Inc. All rights reserved. AnyTrans®, PhoneRescue®, PhoneClean® are trademarks of iMobie Inc., registered in the U.S. iPod®, iPhone®, iPad®, iTunes® and Mac® are trademarks of Apple Inc., registered in the U.S. and other countries. iMobie's software is not developed by or affiliated with Apple Inc.